TRUTH OR CONSEQUENCES, N.M. — When Virgin Galactic's SpaceShipTwo rocket plane broke up in the skies over California's Mojave Desert eight months ago, killing one pilot and injuring the other, the shock wave was felt more than 600 miles away in New Mexico. The schedule for SpaceShipTwo's future space tourism flights from Spaceport America, an 18,000-acre facility that was built in the New Mexico desert with $219 million in state and local tax money, fell apart as well. "It was October 31st, and it was etched in our brains," Christine Anderson, Spaceport America's CEO, told NBC News last week. "You know, we had high hopes that Virgin Galactic would be here by now, flying passengers. And that didn't happen." If everything had proceeded according to plan, Spaceport America would be receiving millions of dollars in lease payments from Virgin Galactic. Instead, Virgin Galactic is having to start from scratch with a second SpaceShipTwo that's still under construction in California. There's no firm timetable for commercial spaceflights from New Mexico. And Anderson is now working on Plan B for Spaceport America. "You can't totally plan out a Plan B," Anderson said. "You have to take what you're learning from the experiment ... and then modify what you're going to do next." The broad outlines of Plan B are laid out in a business plan that Anderson and other spaceport officials issued in May. Some of the initiatives are in line with the spaceport's launch mission — for example, its use by rocketeer tenants ranging from SpaceX to UP Aerospace. Other initiatives extend that mission into other aerospace fields — such as the spaceport's efforts to bring in satellite ground operations and drone test flights. But still other initiatives are pretty far afield from flight. A local company is running guided bus tours to the spaceport, even though there are no takeoffs. Some companies are taking advantage of the facility's 12,000-foot runway to shoot motorcycle and car commercials. There's even a plan to host concerts and weddings. "They're just throwing things at the dartboard," said New Mexico state Sen. George Munoz, who introduced a bill this year to sell off the spaceport. The bill didn't become law, but Munoz hasn't given up. He still wants to see the facility managed by the private sector rather than state officials. "That place is a shopping center, and Virgin Galactic is your anchor tenant — but if Virgin Galactic is not there, you're not going to attract anybody else," he told NBC News. 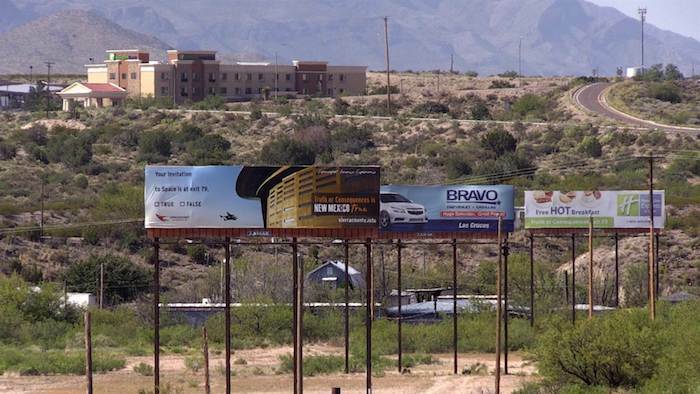 "The spaceport has done nothing for New Mexicans for their tax dollars." How many dollars? How many jobs? The New Mexico state budget allots around $460,000 annually for spaceport operations, and millions of dollars more have been appropriated to improve a gravel road leading to the facility from the south. Even though the passenger spaceships haven't taken off yet, Spaceport America is already earning revenue. It receives $1.6 million a year in pre-flight lease payments from Virgin Galactic, and another $800,000 comes in from other commercial sources, Anderson said. Once Virgin Galactic starts taking passengers to the edge of outer space, at a cost of up to $250,000 apiece, the spaceport's revenue stream should build up to $5 million annually, Anderson said. There's also the potential for entrepreneurs to launch additional tourist ventures close to the spaceport — a luxury hotel, for instance, or an Old West dude ranch. "I think they're waiting for that first flight," Anderson said. She estimated that the spaceport already has created 1,400 jobs — including jobs for the spaceport's firefighters, security workers and maintenance teams. "We are a small city," Anderson said. "There's a maintenance cost to running a city, and so we need to generate enough revenue for that." If and when space tourism takes off, Spaceport America will be well-placed to take advantage of the market, thanks to its average of 340 sunny days per year and its proximity to the controlled airspace at White Sands Missile Range. But how patient are New Mexico's long-suffering taxpayers? For some, patience has run out. "We've already paid almost $300 million on this boondoggle," Sophia Peron said as she held up a protest sign in Truth or Consequences, 28 miles north of the spaceport. Truth or Consequences is the town that's closest to the spaceport's "small city." The place is best-known for its Old West flavor and its hot-spring spas. Its population of 6,400, give or take, is a blend of retirees, families and artsy types — and for years they've been hoping to see an economic boost from the spaceport. Those hopes took a big hit last October, said Jeff Dukatt, who runs a tie-dye shop on the road that leads from Truth or Consequences to the spaceport. "The interest died significantly after the crash," he told NBC News. "They've put it off so much, and so much," said Nina Gomez, a kitchen worker at Sparky's Burgers in Hatch, another town that's 34 miles south of the spaceport. "Everybody's just waiting for the business and the jobs." Even Linda DeMarino, who's the executive director of an economic development group called Main Street Truth or Consequences, acknowledges that so far, the hoped-for boom has been a bust. "We do have the highest vacancy rate we've been in for a while," she told NBC News. "A lot of people were banking on the spaceport, and they didn't have a great business plan to begin with. After the crash, they threw up their hands. But Virgin Galactic was really great. They came around and tried to get the word out that they were still committed to Spaceport America." Just after the October crash, DeMarino and her husband, Blair Wyman, also made a commitment to the future of Spaceport America and Truth or Consequences. They bought a storefront on the town's main thoroughfare. Now they're converting it from a shuttered restaurant into office and retail space. Despite all the setbacks and delays, Wyman is sold on the spaceport. "This is quite possibly the next level of transportation," he said. And as you'd expect, Anderson is sold as well. "It's going to happen — it's not a matter of if, but when," she said. "It seems like we're inching along right now, but that's how you make history." As I move on after five and a half years on this tremendously important project, I am reflecting on our past accomplishments and our future at Spaceport America. I am very proud of the fact that we built a small city in the middle of nowhere, helped to shape the future of the commercial space industry, inspired thousands of young people to consider a career in engineering, science or math, commercialized a brand which has brought the State of New Mexico over $104 million in positive Earned Media in the past year – that means positive media exposure that we did not have to pay for – and are attracting and signing many new customers, resulting in increased economic development in New Mexico. This year, we are covering 75 percent of our operational budget through revenue and, next year, we project that we will be covering 90 percent. This means we have almost reached our goal of being self-sustaining. Spaceport America’s strategic value proposition to the commercial space industry is our proximity to and close working relationship with the U.S. Army White Sands Missile Range, with its 6,000 square miles of protected airspace. Our remote and secure location provides aerospace companies a certain level of much-needed privacy to protect their proprietary technologies. These attributes, paired with our extensive space launch experience, make Spaceport America a major player within the evolving commercial space industry. As a founding member of the Commercial Spaceflight Federation, the commercial space industry association with over 70 leading members, Spaceport America has been instrumental over the past 10 years in shaping the future of commercial spaceflight law and regulation. I have also been a member of the FAA Commercial Space Transportation Advisory Committee for over four years. Spaceport America’s business development, aerospace and ground operations teams have worked tirelessly since our spaceport became operational in 2013 to take our offering to the market, and fill both our aerospace and non-aerospace business pipelines with new leads and opportunities. We have conducted 28 launches to date and UP Aerospace, EXOS Aerospace Systems and Technologies, along with one other new customer, have planned six launches in the next few months. We are also in discussions with three major companies for long-term flight testing; each requiring local support, technical services and construction. We are also very excited about the recent opportunity to partner with the U.S. Army White Sands Missile Range to assist with testing Boeing’s Crew Space Transportation System at Spaceport America. Last year, Spaceport America achieved another milestone – our first major motion picture was filmed when we turned part of the horizontal launch area into a Hollywood movie set that brought work to over 500 extras and hundreds of film professionals in New Mexico. “The Space Between Us” by STX Entertainment will premier in theaters across the country on December 21, 2016. That same week, we were supporting an aerospace customer flight test campaign, while welcoming tourists from countries as far away as the UK and Australia – all part of a day in the life of our commercial spaceport. Stay tuned for an announcement about four new very exciting recurring Annual Spaceport America Signature Events starting this fall, each bringing in hundreds of participants and attendees requiring services from hotel accommodations to food and equipment rentals. We will have our third Public Open House Oct. 1 – free to the public. Registration will open Sept. 1. Please come. One of our favorite activities is hosting students at Spaceport America – the seed corn of our future. We conducted sessions with over 2,000 6th-grade students last school year and will begin again in September. All free. So, the next time you read an article or hear someone say something that gives you the impression that Spaceport America is not doing well or isn’t taking the lead in the commercial space industry, don’t believe it! And, if you are not getting our News bursts, please sign up on our website spaceportamerica.com/newsbursts so you can keep up to date on all of our happenings. I am looking forward to watching the spaceport continue to grow and thrive. I have appreciated your support for our spaceport. 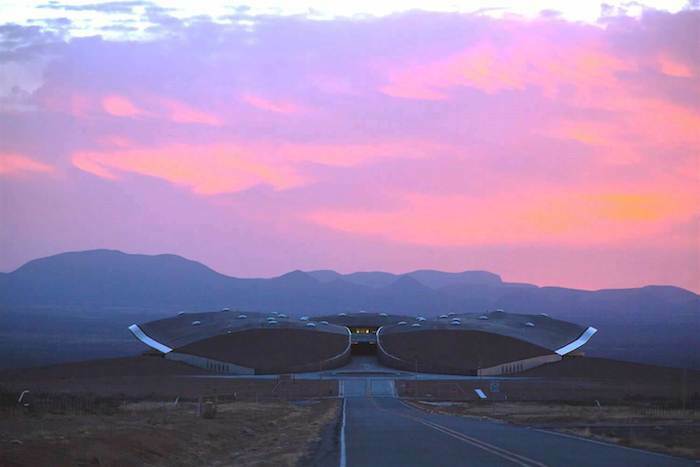 Spaceport America is a real game-changer for New Mexico. It is great news that the county has selected a contractor who will soon begin construction of the southern road to Spaceport America. The project has been delayed for years by a lengthy BLM review, squabbling between Sierra and Doña Ana counties and funding shortages. Without it, visitors have to drive north all the way to Truth or Consequences, and then head back down southeast. In past years, the Spaceport Authority had dipped into the road fund to pay for operations. Even now, the $13 million to $13.6 million that the Spaceport Authority says it has available is less than the $15.2 million originally projected for the cost of the road. Interim County Manager Chuck McMahon said they would seek additional funding from the state to build the road as originally intended. But even if the state declines that request, they will still be able to complete the project with the money on hand, with a smaller base course for the roadway foundation. The County Commission voted 4-1 to move ahead with the project. The lone “no” vote by County Commission member John Vasquez not to spend money already appropriated for this project makes no sense. To be clear, no additional county money was approved with Tuesday’s vote. Vasquez voted against spending money that had already been appropriated by the state. “I don't know what we're doing up there, other than sending up rockets like we've always been doing from White Sands air space," Vasquez admitted in explaining his no vote. If the commissioner honestly doesn’t understand the difference between WSMR and the spaceport, he needs to educate himself before the next vote comes up. The southern road has always been a critical component for Las Cruces and Doña Ana County to be able to gain the full economic advantages of the spaceport. Delays in getting it built have coincided with delays in Virgin Galactic’s development of the spaceships it will use to blast passengers into sub-orbital space from the spaceport. But that process is coming to a conclusion. Speaking earlier this month at the Symposium for Personal and Commercial Spaceflight, Virgin Galactic Vice President Mike Moses said they “hope to be in space by the end of this year,” though he added that they would launch until ready. Once Virigin Galactic begins regular launches, wealthy space tourists will be coming to southern New Mexico to be among the first to have that experience. If there is a southern road in place, those wealthy tourists will most likely be staying in Las Cruces, eating in our restaurants and browsing in our shops. If the southern road is not in place, they will more likely be staying in Albuquerque, eating in their restaurants and browsing in their shops. Virgin Galactic says to be patient, New Mexico. It is coming. Officials from the company at the center of Spaceport America’s hopes for success say they are getting ready for a “big move,” with plans to base an additional 85 employees in the Las Cruces area over the next year. With Virgin Galactic’s leaders talking of starting full passenger spaceflight operations by the end of 2018, boosters of the publicly financed $220 million facility and even skeptical policymakers are hoping that New Mexico’s bet on the commercial space industry will soon begin to pay off. 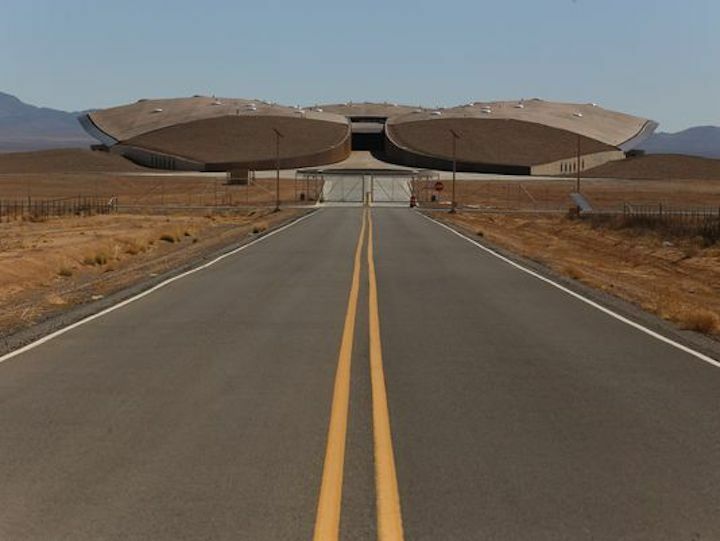 Spaceport America opened in late 2011, sold as a destination for wealthy adventurers willing to pay $250,000 for a ride into the heavens on Virgin Galactic’s private spacecraft. While the facility has been host to several dozen rocket launches since it opened, tourists are not taking flight from the facility yet, six years later. 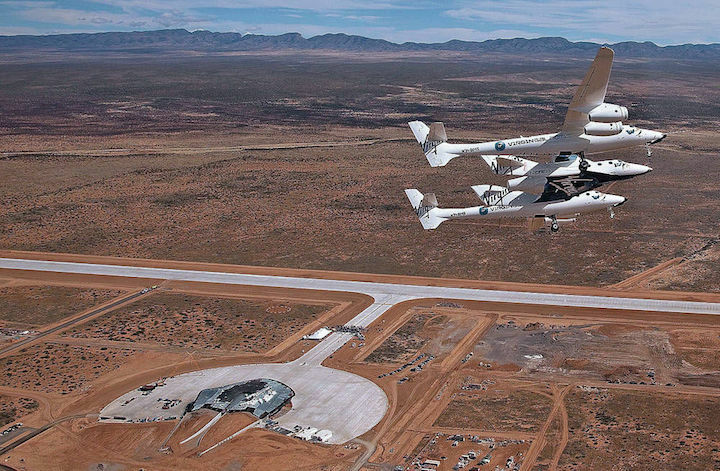 Much of Virgin Galactic’s work remains concentrated at another spaceport in California’s Mojave Desert. And while the spaceflight industry is growing, the focus has shifted from sending tourists into space toward research and other commercial missions, particularly now that NASA has ended its shuttle program. Critics argue Spaceport America is a boondoggle. Shoppers in Doña Ana and Sierra counties still pay a special gross receipts tax on their purchases to help cover the cost of building the futuristic facility. Meanwhile, plans to launch spacecraft from the site continue to move along. Virgin Galactic’s plans have suffered setbacks, particularly with the crash of a test flight over California in 2014 that killed a co-pilot. And as recently as last month, Virgin Galactic’s president said the company’s billionaire founder, Richard Branson, won’t be headed to space in the next six months despite his proclamation that he would be “very disappointed” otherwise. Earlier this year, Branson told a conference in Hong Kong that Virgin Galactic was resuming test flights and aimed to launch full commercial passenger operations by the end of 2018. Dalbello said the company’s next steps are to continue testing of its SpaceShip Two vehicles in California, move staff to New Mexico and complete testing of the crafts here. The SpaceShip Two is designed to carry people and cargo into suborbital space and back, with a crew of two pilots and up to six fare-paying astronauts or payloads for research. Another craft, the WhiteKnight Two, would carry the vehicle part of the way. The company has been testing the two together. The company also has tested SpaceShip Two gliding without an engine. Space.com reported in October that Mike Moses, president of Virgin Galactic, said the company aims to get SpaceShip Two vehicles up to 50 miles above Earth’s surface in the coming months. Meanwhile, Virgin Galactic says it has added 10 full-time employees in New Mexico since this time last year and will have 30 full-time staff in the state by the end of 2017. If tests go according to plan, Dalbello said, another 85 employees will move to the Las Cruces area over the next year. Local authorities are moving ahead with long-stalled plans to improve a road running south from Spaceport America through the desert toward Las Cruces. The road would make it easier to reach the facility from the south, without the need to drive over from Truth or Consequences. But that has worried some in Sierra County, who have been concerned they might be cut out of business drawn by the Spaceport. The Spaceport Authority, the state agency that operates the facility, approved a budget request for the next year of about $1 million from the general fund, up $375,000 from this year with an eye toward more aggressively recruiting business to the site. That might seem like a tough sell when the state’s budget is still tight and lawmakers face pressure from constituents who view the project as a waste of money. Legislators on both sides of the aisle seem eager to see it take off. “I think everyone here wants it up and running,” Sen. Mark Moores, a Republican from Albuquerque, told Dalbello. Contact Andrew Oxford at 505-986-3093 or aoxford@sfnewmexican.com. Follow him on Twitter @andrewboxford.